The submission file is in OpenOffice or Microsoft Word, document file format. The references have been prepared as per journal's required format. Where available, URLs and doi for the references have been provided. The text is single-spaced; uses a 12-point font; and all illustrations, figures, and tables are placed within the text at the appropriate points, rather than at the end. 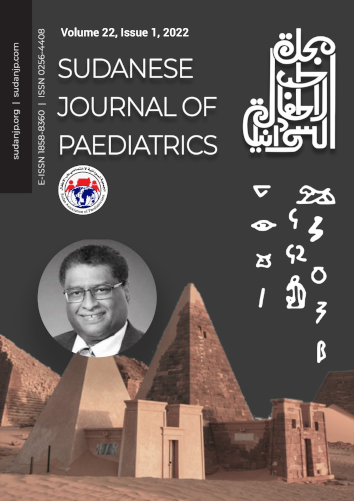 To address the task of the expansion of the Sudanese Journal of Paediatrics (SJP) to encompass the scientific work dealing with child health locally and abroad, it will be the purpose of the Editorial Board of SJP to encourage authors to submit high-quality papers for the refereed publication and to make a more varied source of material to our readers. “Guidelines to Contributors “are published to help the authors to present their data in accordance with the currently accepted uniform style for submitted manuscripts. It is based on the recommendations of the International Committee of Medical Journal Editors  with minor modifications to suit the local facilities in developing countries. Type manuscript should be doubled-spaced and include title page, abstract, text, acknowledgements, references, tables and legends. Illustrations must be good quality, unmounted glossy prints usually 127x17.3 cm (5x7 in) but no larger than 20.3x254 cm (8x10 in). Submit two copies of manuscript and figures in heavy-paper envelope. Submitted manuscript should be accompanied by covering letter, and permission to reproduce previously published materials. Authors should keep copies of everything submitted. There is no need to send a hard copy when an article is submitted electronically (by e-mail). Figures should be submitted, as attached files, in JPG or TIFF format. Type manuscript on one side of good quality A4 paper (30x21 cm), with margins of at least 2.5 cm (1 in). Use double spacing throughout, including title page, abstract, text, acknowledgements, references, tables and legends. Number pages consecutively, beginning with the title page. Type the page number in the upper right-hand corner of each page. The title page should contain (1) the title of the article, which should be concise but informative, (2) first name, middle initial, and last name of each author, with highest academic degree(s), (3) name of department(s) and institution(s) to which the work should be attributed. If an author has moved since the work described in the manuscript was done, a “Current address” may be indicated as a footnote to that author’s name, (4) disclaimers, if any (5) name and address of author responsible for correspondence about the manuscript with telephone number and e-mail address provided, (6) name and address of author to whom request for reprints should be addressed, or statement that reprints will not be available from the author, (7) the source(s) of support in the form of grants, equipment, drugs or all of these. The second page should carry an abstract of not more than 250 words. The abstract should state the purposes of study or investigation, basic procedures, (study subjects or experimental specific data and their statistical significance, if possible), and the principal conclusions. Emphasize new and important aspects of the study or observations. Use only approved abbreviations. Methods: Describe your section of the observational or experimental subjects (patients or experimental animals, including controls) clearly. Identify the methods, apparatus (manufacturer’s name and address in parenthesis), and procedures in sufficient detail to allow other workers to reproduce the results. Give references to and brief descriptions of methods that have been published but are not well known; describe new or substantially modified methods, give reasons for using them, and evaluate their limitations. Acknowledge only persons who have made substantive contributions to the study. Number references consecutively in the order in which they are first mentioned in the text. Identify references in the text, tables, and legends by Arabic numerals. References cited only in tables or in legends to figures should be numbered in accordance with a sequence established by the first identification in the text of the particular table or illustration. Try to avoid using abstracts as references; “unpublished observations” and “personal communications” may not be used as references, although references to written, not verbal, communications may be inserted [square brackets] in the text. Include among the references manuscripts accepted but not yet published; designate the journal followed by “in press” [square brackets]. Information from manuscripts submitted but not yet accepted should be cited in the text as “unpublished observations” [square brackets]. Jalloh S, Van Rostenberghe H, Yusoff NM, Ghazali S, Nik Ismail NZ, Matsuo M, et al. Poor correlation between hemolysis and jaundice in glucose 6-phosphate dehydrogenase-deficient babies. Pediatr Int 2005; 47:258-61. The committee on enzyme of the Scandinaian Society of Clinical Chemistry and clinical Physiology, Recommended method for the determination of gammaglutamyltransferase in blood. Scand J Clin Lab Invest 1976;119-25. Barkovich AJ. Pediatric Neuroimaging (4th ed). Philadelphia: Lippincott William &Wilkins,2005. Americal Medical Association Department of Drugs. AMA drug evaluations. 3rd ed. Littleton: Publishing Science Group, 1977. Armstrong DL, Halliday W, Hawkings C, Takashima S, eds. Pediatric Neuropathology: A Text- Atlas. New York: Springer; 2007. Salih MAM. Genetic disorders in Sudan. In: Teebi AS, ed. Genetic Disorders among Arab Populations (2nd ed). Berlin Heidelberg: Springer-Verlag, 2010:575-612. JAMA’s key and critical objectives. Available at: http://jama.ama-assn.org/misc/aboutjama.dtl. Accessed June 7, 2011. Shaffer RA. Advances in chemistry are starting to unlock mysteries of the brain: discoveries could help cure alcoholism and insomnia, explain mental illness. How the messengers work. Wall street Journal 1977Aug 12;1 (col1), 10 (col 1). Roueche B. Annals of medicine: the Santa Claus culture. The New Yorker 1971 Sep 4:66-81. Submit the required number of complete sets of figures. Figures should be professionally drawn and photographed; freehand or typewritten lettering is unacceptable. Instead of original drawings, roentgenograms, and other material, send sharp, glossy black- and -white photographic prints, usually 12.7x17.3 cm (5x7 in) but no larger than 20.3x25.4 cm (8x10in). Letters, numbers, and symbols should be clear and even throughout, and of sufficient size that when reduced for publication each item will still be legible. Titles and detailed explanations belong in the legends for illustrations, not on the illustrations themselves. Each figure should have a label pasted on its back indicating the number of the figure, the names of the authors, and the top of the figure. Do not write on the back of the figures or mount them on cardboard, or scratch or mark them using paper clips. Do not bend figures. Photomicrographs must have internal scale markers. Symbols, arrows or letters used in the photo micrographs should contrast with the background. Mail the required number of manuscript copies in heavy paper envelope, enclosing the manuscript copies and figures in cardboard, if necessary, to prevent bending of photographs during mail handling. Place photographs and transparencies in a separate heavy paper envelope. There is no need to send a hard copy when an article is submitted electronically (by e-mail). Manuscripts should be accompanied by a covering letter from the author who will be responsible for correspondence regarding the manuscript. The covering letter should contain a statement that the manuscript has been seen and approved by all authors. The letter should give any additional information that may be helpful to the editor, such as the type of article the manuscript represents in the particular journal, information on publication of any part of the manuscript, and whether the author (s) will be willing to meet the cost of reproducing colour illustrations. Include copies of any permission needed to reproduce published material or to use illustrations of identifiable subjects. 1. International Committee of Medical Journal Editors. Uniform requirements for manuscripts submitted to biomedical journals. http://www.icmje.org. Updated 2009. Accessed June 7, 2011.